Halloween has arrived early at FBTY. Although I didn’t grow up celebrating this fun event, as an adult I have often dressed up in costumes and gone trick-or-treating with my daughters, who enjoy this celebration a lot. This year we are sharing a quick, ridiculously easy, and fun “recipe”: Creepy Jello Cups!!! 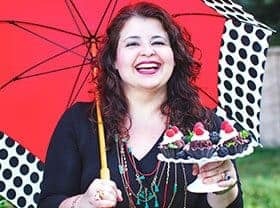 They are something that one can prepare in the blink of an eye, saving time for Moms so that they can take care of other stuff… and of course they are also lots of fun for the kiddos and TEENS, too. I mean, whose kid/teen doesn’t love gelatin and candy? Both of them together in a mini cup is much, much better, don’t you think? Three-ingredient, ten-minute prep, and no cooking Halloween treat... 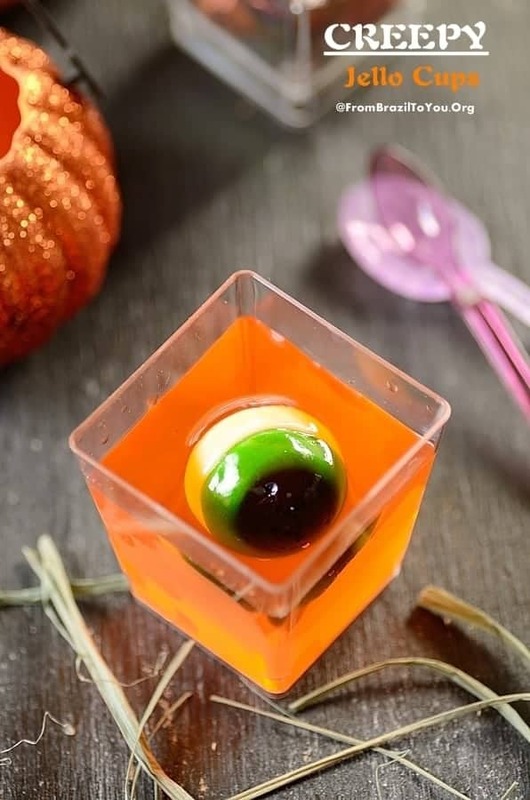 These Creepy Jello Cups are a fun, tasty dessert that combines gelatin and candy into mini cups. Prepare for your kid/teen/adult party! In a heatproof glass pitcher, dissolve gelatin powder in boiling water, stirring very well until gelatin is completely dissolved. Pour mixture into 80 ml (about 3-ounce) plastic mini cups and refrigerate for about 1 hour, or until gelatin is semi-set (not liquid, but also not yet completely set...i.e. it is just starting to solidify, so that candy can still penetrate easily into the gelatin). Remove cups from the refrigerator and place one gummy body part into each cup. Refrigerate for about 2 hours or until gelatin has completely set. 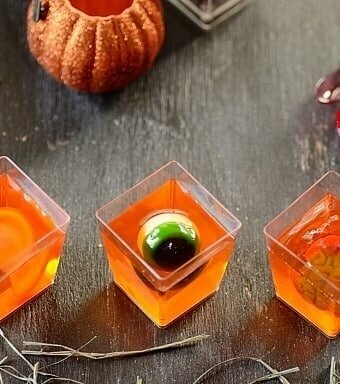 Remove jello cups 10 to 15 minutes prior to serving ( so that candy can soften)... Enjoy!!! 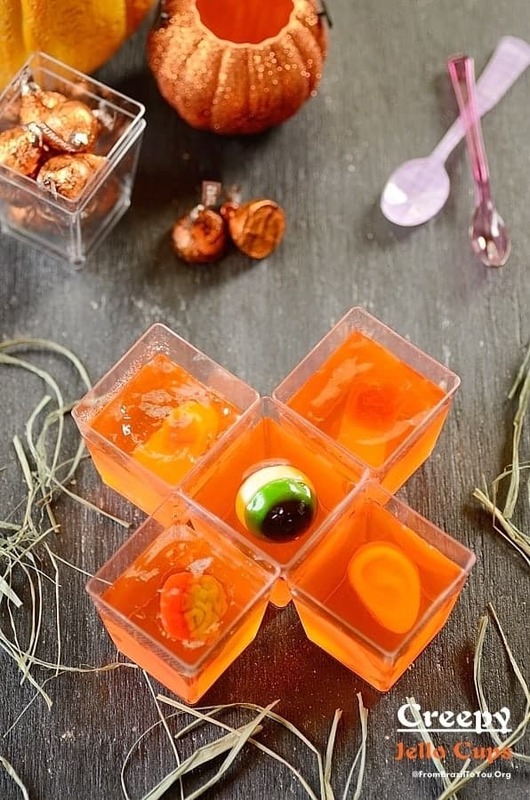 These creepy jello cups can be prepared up to 2 days ahead. Do not place gummy body parts candy into the hot dissolved gelatin, otherwise candy will melt. How fun Denise! This is a great idea. It made me smile from ear to ear (real ears, not candy)! Pinning! Thanks for sharing this, Chris! Halloween is the period that I really have most fun. ok, they are fun and PERFECT for Halloween….. Thank you, Sally! They are quite creepy yet easy and delish. I had a lot fun making and photographing these cups. Woweee!!!!! Lovin’ this Denise. I saw Pumpkin lanterns in the shop last weekend & got all excited thinking about the magical blogs & ideas in store. Hi, Anna! Because I didn’t grow up celebrating Halloween, I do have a lot of fun making treats and dressing up to trick-or-treating with my children. I am glad that you approved my creepy treat for this year. Wishing you a fun Halloween! Love this….just adorable for kids! Thanks Denise. Halloween is such a great family holiday! The Creepy Jello Cups are a fantastic treat to take to a party, easy to make ahead with tons of fun in each cup! Thank you, Deb! This was my intention: Make the whole thing easy and fun for both Moms and children. Raymund: Thanks a lot! I hope children love these cups. Wow, they are adorable creepy, Denise! The creepy jello cups are amazing. Daniela: Thank you!!! It is a fun treat for Halloween. These are creepily adorable! Clever idea and super easy too. We’ve never been into the whole Halloween thing, but it’s fun to watch all the cool crafty and foodie things that appear at this time! I bet the girls are excited! Nasneen: The girls are always excited for Halloween. They have a lot of fun dressing up in costumes and eating candies. 🙂 Thanks for stopping by. What a great idea – so simple and yet so incredibly creepy! Also love those Mother-in-law eyes and Pumpkin Brigadeiros! I am glad that you approve these Halloween treats. They are quite simple yet delish. What fun this is! Love that eye looking at me! Really creative — and creepy! 🙂 Thanks! Juliana: Thank you! I hope children and adults as well have a lot of fun eating these jello-candy cups. I had no idea Halloween was celebrated in Greece. How interesting! I hope you can make these quick and easy cups in February. I had a lot of fun photographing them. You both have a great weekend! So you are ready for Halloween!!! What a creapy thing!!! Thanks for sharing it, Kiran! 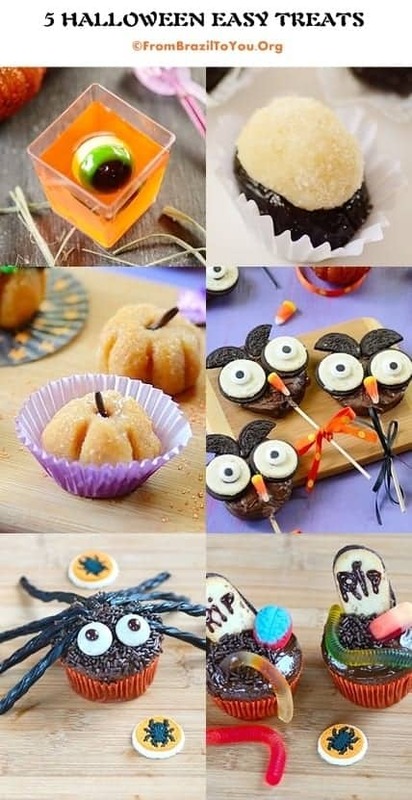 These are so fun and creative for Halloween! I love Halloween – it’s my favorite. I enjoy it because I did not grow up celebrating it and it is fun — I have to admit. My fave holiday in the US is Thanksgiving. But I don’t know how to submit it. Could you please let me know how? Thank you! Definitely cute instead of creppy for my eyes!!! my nieces gonna love this…. Oh jeez these are cute! My kiddos would go crazy for these creepy treats + all the other ones too! What great ideas! Thanks, Kate!!! I hope you make these for your kids…Wishing y’ all a Happy Halloween!! !